Now normally reviews of the year come at the end of the year. 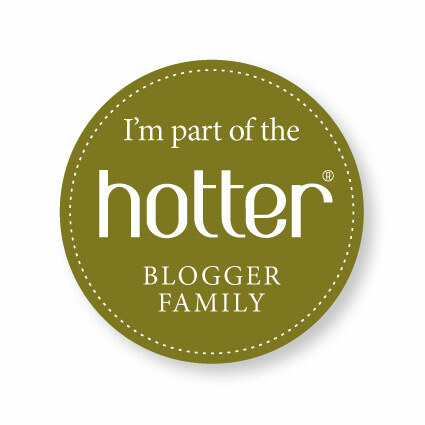 It’s the kind of blog post that people publish between Christmas and New Year as a sort of round up. That was my plan, but like all the best laid plans it didn’t happen. Many reasons, but the biggest one being that by the time we got to that weird period between Christmas and New Year I was just absolutely shattered! I also sat down then with a notebook and realised that I actually did far more in 2016 than I’d realised, and just one blog post wasn’t going to do the year justice. So, welcome to what is likely to be the first in a series of posts about my 2016. 2016 has been a bit of a funny old year on so many fronts. In a way it doesn’t seem like two minutes since I was sat there on New Years Eve 2015 frantically crocheting trying to finish the giant Attic 24 ripple blanket that I was determined to complete before the end of the year. 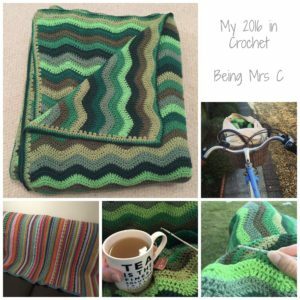 It took me months to blog about it and then for some reason I struggled to blog much more about my crafty achievements in 2016. 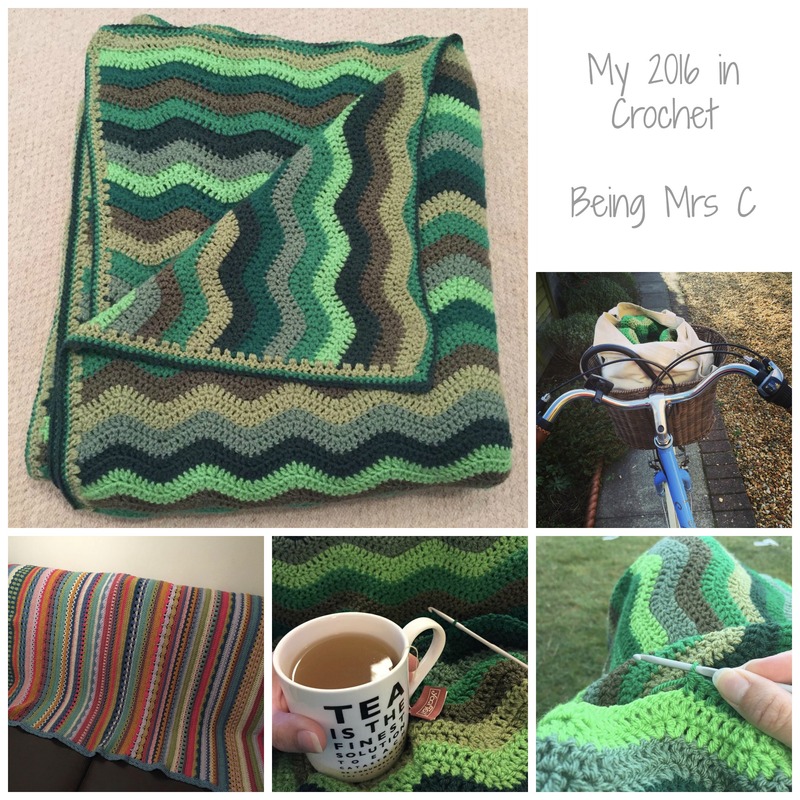 Crochet was my main craft in 2016 and there were two projects that took up most of my time. 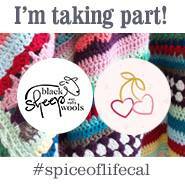 Firstly I completed a second Spice of Life blanket which I absolutely loved doing. When doing the first one it was very much a learning process (and if I’m honest painfully difficult at times) but the second one was a breeze in comparison and so much fun to watch it grow. I love the pattern and the Stylecraft DK yarn that I used on the second one so much that the very end of 2016 saw me start a third in a lovely autumn colour-way. Fingers crossed this will be my first finished project of 2017. 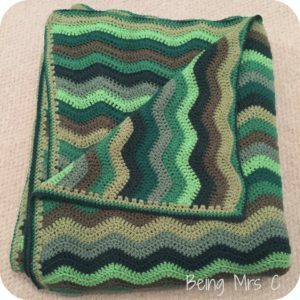 There was one big crochet project that dominated the year and that was a huge ripple blanket that I decided to make for a friend. Based on the Attic 24 pattern that started me off on this crochet adventure I free-styled it a bit by deciding to use 7 different shades of green in a random pattern and I also guessed a bit at how long that initial starting chain should be. Now I can put my hands up and say I got it a bit wrong. I made my blanket far, far, far too wide and hence to get the overall dimensions to look in proportion I had to keep going with the rows for longer than I really wanted to. I started this blanket in late June and it was late November when I finally finished it! Over five months of crocheting. 80 colour ripples in total, each one of which took at least an hour to do. Then there was the starting chain (which I seem to recall had three versions before I was happy with the tension) and also the three rows of edging. This blanket went with me on car and train journeys. It came on camping holidays, cottage holidays and even to Tea and Tents where I sat working on it in the sunshine whilst listening to various speakers. It was worked on whilst I watched TV, listened to the radio, watched the kids playing, waited for people in various places, drank tea, attended WI meetings, whilst I chatted on the phone (hands-free is a wonderful thing) and even sat in bed some evenings. 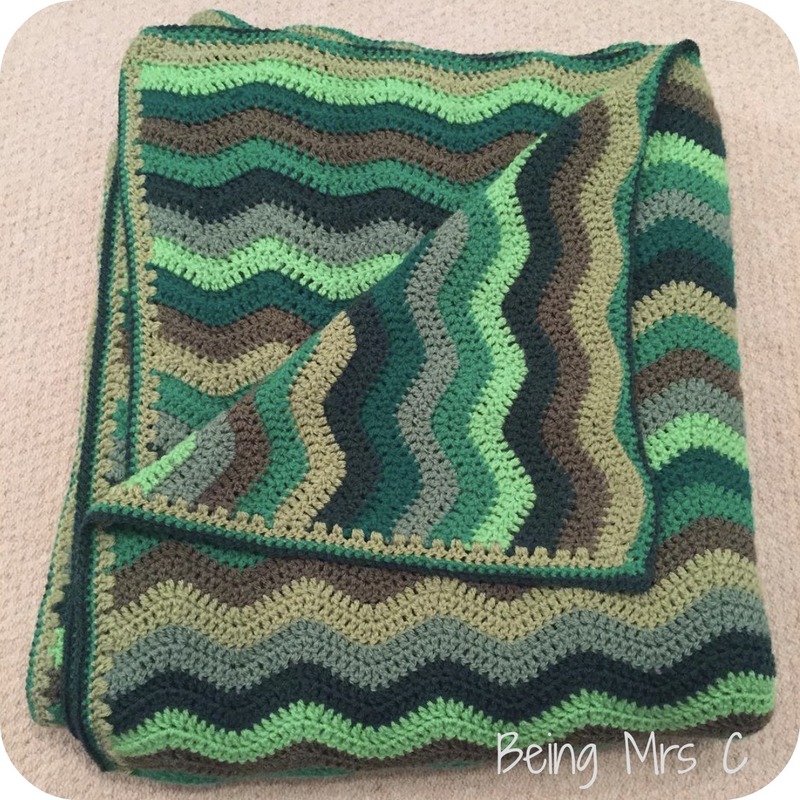 Yes, there were times when it was a tad frustrating and I was very ready to see a different colour by the end, but actually I loved making this ripple blanket. And when it came to send it off to the friend I’d made it for I felt like I’d put a precious child into the hands of Royal Mail. I only have one regret though. I forgot to measure the damn thing before I posted it! So, if you ever read this friend who received it (consider this like a test, although I doubt you will!) please can you get a tape measure out and let me know just how big it was in the end please. 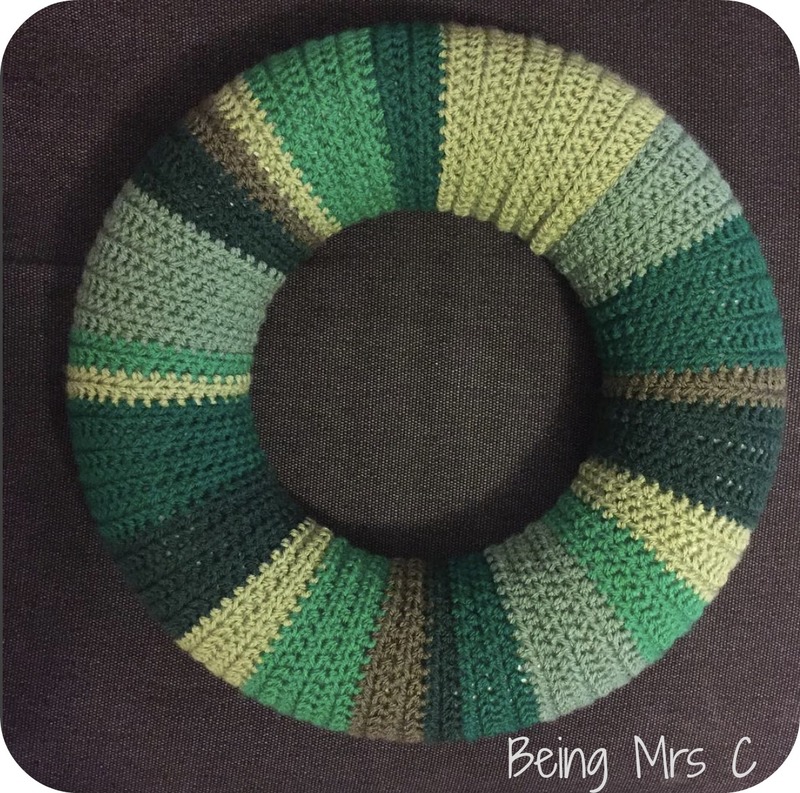 Although I thought I’d had enough of green by the end I did decide to use up some of my left over yarn to finally make a crochet Christmas wreath. The crochet part was literally finished on Christmas Eve, so decorations on it will have to wait until Christmas 2017, but I was pretty pleased with the final result. That’s me done for green though for a while! So, as I say, the year ended with me starting my third Spice of Life and I’m making pretty fast progress with it. That’s not going to be my only crochet project on the go though as my sister kindly bought me the yarn pack for the Attic 24 Moorland CAL which starts tomorrow. I’m super excited about this, mainly because I think the colours are absolutely gorgeous and I love a new challenge, but also because my Mum is also taking part in the CAL and (as much as I love my online friends) I’m looking forward to having someone in real life to talk to about it!